Awesome job on the Frog of Thunder! 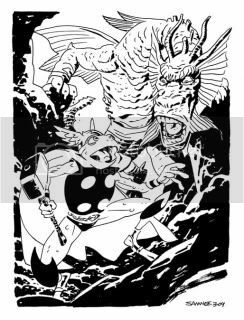 Walt Simonson's run on Thor was great and a must read! Dude, you get the craziest commissions! Thanksabunch, Alan, Brian, Fred and Mike! Wow! This is so very cool! Strange requests often bear rare fruit, and this is rare fruit, indeed, sir. This is such a fun concept, that I'm jealous that I didn't come up with it first. You really laced up your sneaks and ran with this one, Chris! I love it!